I made another notebook cover. This one is for Ginger #2's speech therapist. 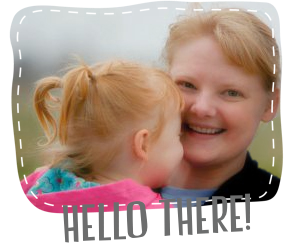 Ginger #2 happens to be turning the big THREE on Saturday, so her speech therapy continues at school and not at home. Her speech therapist is so lovely, and has been a great teacher to me and Ginger #2 as we learn to communicate through sounds and signs. I wanted to make her something special. 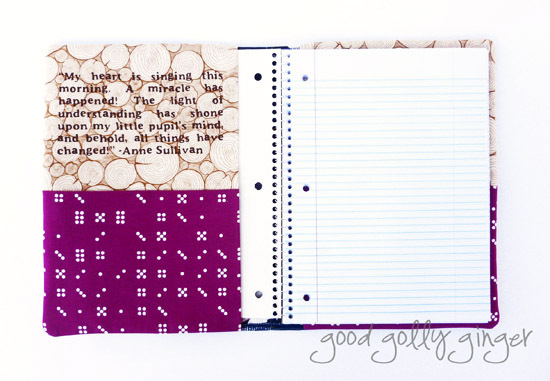 Again, I followed Lori Holt's Notebook Cover pattern. This is a free download, and a standard notebook fits perfectly inside. The pattern has a lot of pockets. This time, I used my Silhouette to personalize the cover. I added a quote on the inside of the notebook cover. 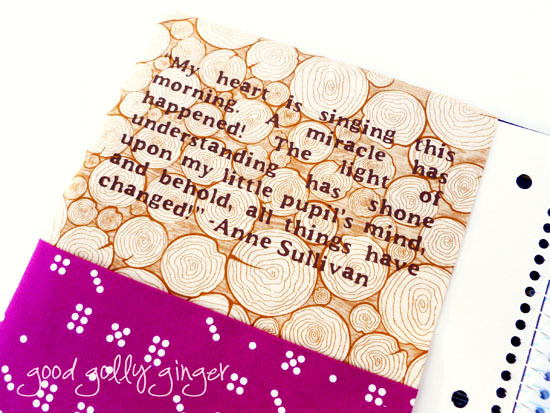 Anne Sullivan was Helen Keller's teacher. I thought this quote fit the bill perfectly. My other notebook cover can be found here. Thank you for being a teacher! I hope you have a lovely day and thank you for stopping by! I love this! And that quote is beautiful and perfect for a speech therapist. Thanks for linking up to TGIFF this week! What a lovely and thoughtful gift. I hope she loves and appreciates it! She really did love it! Thank you so much for you kind words and for visiting! What a beautiful gift! The quote is lovely, too. What a great gift idea. I love the fabric combos you selected!